msg.ai is an AI platform for customer service enabling brands to automate proactive support on email, chat and social. "Msg.ai enables guests to discover destinations, book trips & receive instant support through AI"
Everyone on the msg.ai team goes above and beyond to ensure that our conversation AI is working well and enhancements are achieved as quickly as possible. In the first few months of our AI chatbot being live, the msg.ai team was efficient at addressing issues that we had not discussed and ensured that the AI was learning as quickly as possible. Msg.ai is regularly making us aware of new opportunities to enhance our Messenger chatbot or new technology that we could adopt to improve the guest experience. Our roadmap continues growing an evolving as priorities are adjusted. This along with our regular sustainment projects has the msg.ai engineering team running at capacity almost all the time, and having their primary engineering team located in India has its benefits and downfalls. The majority of our development is done overnight, which means that when we get into the office in the morning, we can see some of the work that has been completed. The downside is that we may have to wait overnight to get answers to questions that we may have. This is something that msg.ai plans to address in the future. The work that msg.ai has begun is the foundation that we will be building on the streamline our guest services process, ensuring that guests have quick and easy access to many of the questions they have and solutions to tasks that they wish to achieve. This will free up members of our contact centre to focus on more complex tasks and provide exceptional guest experience. * We monitor all msg.ai reviews to prevent fraudulent reviews and keep review quality high. We do not post reviews by company employees or direct competitors. Validated reviews require the user to submit a screenshot of the product containing their user ID, in order to verify a user is an actual user of the product. Hi there! 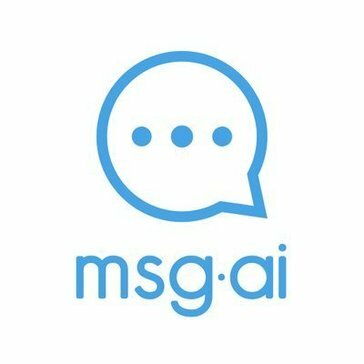 Are you looking to implement a solution like msg.ai?